Just as we get used to High Definition LCD and plasma TVs, it looks like something even better may be coming along to replace them both. Although there is no way of being sure what’s going to be sitting in people’s living rooms ten years from now, one thing is for certain; a new type of TV has emerged in the marketplace with even smoother, sharper and more richly coloured images than those offered by today's LCD and plasma screens. The technology behind these new TVs is called OLED and uses ‘organic light-emitting diode’. Like all television sets, OLEDs colour their pixels by mixing different intensities of blue, green and red light. The new screens use thin films of organic molecules that create this light when electricity is applied. One of the big advantages of this technology is that pixels can be completely turned off when recreating the colour black, resulting in incredible dark scene detail and an incredibly high contrast ratio of 1,000,000:1. This is astonishing when you compare it to the maximum contrast ratio of an LCD television, which is about 10,000:1. As well as providing brighter, crisper images, OLEDs also use less energy than the conventional light-emitting diodes (LEDs) or LCDs used today. This is because the organic pixels create light themselves and have no need for a backlight like most television sets. Another reason this technology has electronics manufacturers so excited, is that it’s possible to make OLED screens incredibly thin (about the thickness of a 2 pence coin). So thin in fact, that they are even being developed in a foldable form, which could one day be used on T-shirts or even as labels on drinks bottles. As with most new technology, there are some downsides to OLED. If you’re careful enough not to accidentally snap the wafer thin screen in half, then there is still the issue of lifespan. Currently most LCD and plasma screens are expected to last approximately 60,000 hours (27 years at 6 hours per day), whereas an OLED display will fade to half its brightness by about 30,000 hours (13.5 years at 6 hours per day). This may seem like a bit of a blow to the OLED market, but fortunately methods of extending their lifespan are being developed. It’s also worth remembering that most people average less than 6 hours watching TV per day, and replace their TV more often than every 13.5 years. The first OLED TV has been launched with a very modest screen size at a mere 11 inches and with a price tag that wouldn’t look out of place on a 50” plasma. For some time this miniature marvel has been the only OLED available on the market, but some of the big manufacturers have now announced plans for larger models to be released. Consumers should expect to pay a fairly hefty price for these initial models, but the cost will eventually fall as the technology is developed further and more and more manufacturers start using it. One thing that the major television manufacturers seem to agree on, is that OLED technology looks set to take over as the next generation of television. 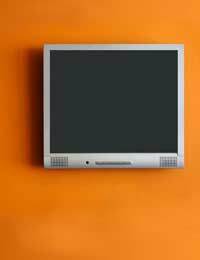 What is the Difference Between LCD & Plasma TVs?